The Galápagos Islands hold almost mythical standing in the world of exceptional vacation destinations. For many seasoned travelers, the archipelago - where Charles Darwin began to develop his theory of natural selection - is a bucket list trip. However, it may not be the right trip for your family. While a family could base themselves on the island of San Cristóbal, Santa Cruz or Isabela and then organize day trips to different points of interest, it’s not a particularly efficient way of seeing the Galápagos; you end up missing the most interesting islands that require more travel. Instead, travel-savvy families opt for a cruise. But this mode of transportation is not for everyone. Before you spend a small fortune to book this trip of a lifetime, ask yourself the following 8 questions. 1/Does my child fly well? The Galápagos Islands are remote, and it takes considerable effort to get there. From the United States, you fly to either Quito or Guayaquil and stay two nights. (The flight arrives late. You’ll then want to have a buffer day so as not to miss boarding your ship, if there’s some delay.) Then you fly on to the Galápagos Islands, 600 miles off the coast. 2/Is my child prone to seasickness? You may not know if your child gets seasick. However, it’s likely that he will feel queasy for at least the first two days. Be proactive. Bring anti-seasickness wristbands and patches. Also bring both non-drowsy and drowsy motion sickness medication. I would also suggest bringing melatonin to help you and your child sleep; sometimes the only way to escape feeling sick is to fall asleep. It’s best to medicate in advance of symptoms. Most navigations aren’t too bad, but when the ship is in open water, you’ll likely feel ill.
3/Does my child like structured activities? If you are cruising, your day is not your own. While there is plenty of downtime, meals and activities are scheduled. If your child has difficulty following someone else’s agenda, this vacation is not for your family. 4/Does my child follow directions? When traveling on a boat, there are many do’s and don’ts to keep everyone safe. In addition, because the Galápagos Islands are a protected national park, there are a list of additional rules to follow. For example, visitors must be with a guide at all times. They may not wander off the trails. They can’t get closer than six feet to the animals on land or in the sea. They may not take anything, like shells, home with them. 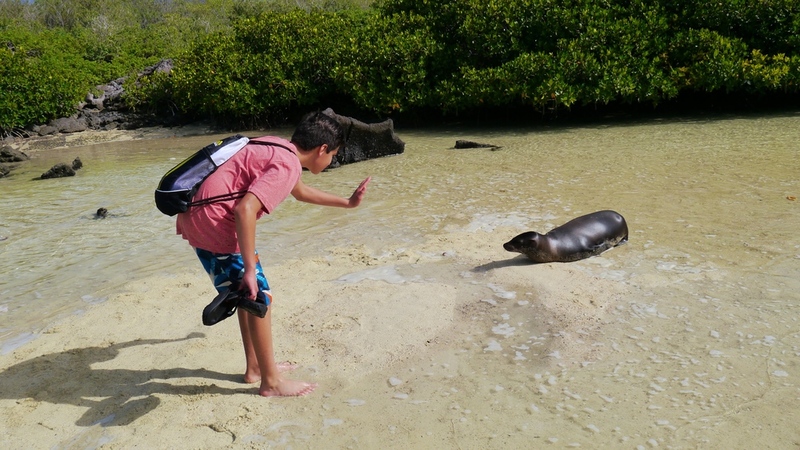 To visit the Galápagos, your child must be able to conscientiously follow the rules. 5/Does my child like to swim? About half of the scheduled activities for any Galápagos cruise occur in the water. Nearly all the water activities involve snorkeling. Your child should be able to swim and snorkel well in deep water. Also, he should be comfortable with underwater wildlife. It’s not uncommon to have a sea lion or a harmless shark swim near you. 6/Does my child love nature & the outdoors? Galápagos cruise ships don’t have pools with water slides. The main attraction is wildlife viewing. That’s really it. It’s extraordinary wildlife viewing, but if your kid isn’t into animals, this isn’t the destination for you. 7/Can my child keep himself busy during downtime? On a Galápagos cruise, there’s typically two to three hours of scheduled activities in the morning and two to three hours of scheduled activities in the afternoon. After lunch, there’s siesta time. There’s also free time before and after dinner. Passengers typically nap, read or play cards, board games or video games. You’ll want to make sure that your child is capable of entertaining themselves easily. 8/Does my child have a good attention span? Nature walks and Zodiac rides can last more than two hours. Your onboard naturalist accompanies you on these outings and provides you with information about the wildlife that you’re observing. The guides are incredibly knowledgable about the animals, in addition to the history and geology of the islands, but know that there’s a lot of listening. For all these reasons, I would not recommend a cruise of the Galápagos for any child under 12. You simply need a certain degree of maturity to manage this kind of trip. It can be a destination of lifetime, but it’s not for every family. To learn more about a Galápagos vacation, click here. To see read Shellie's daily journal including advice to beating sea sickness, click here. Editor Shellie Bailey-Shah admits to being prone to seasickness. And yes, she got sick on her Galápagos cruise. Heed her advice, and hopefully you’ll spend less time in the head. Nonetheless, she says that she’d do it all again to experience the Galápagos with her family. Need help planning at trip to the Galápagos? Our friends at Ciao Bambino! specialize in luxury family travel to bucket-list destinations. Click here to find out more. 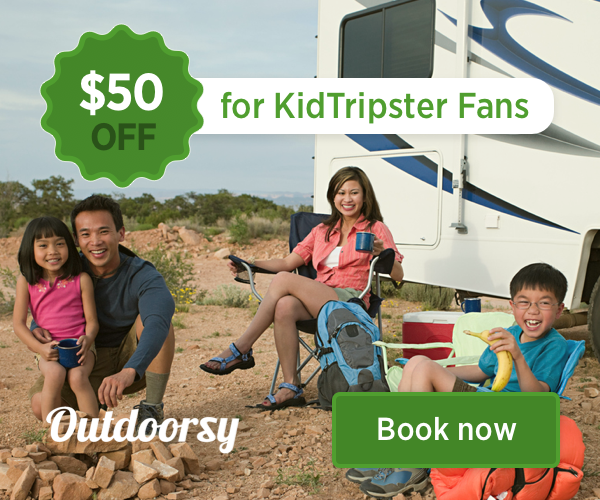 If you end up booking through Ciao Bambino!, KidTripster gets some coffee money at no additional cost to you. Just wanted you to know!